Portable water filter removes dirt and sediments from outdoor water sources. 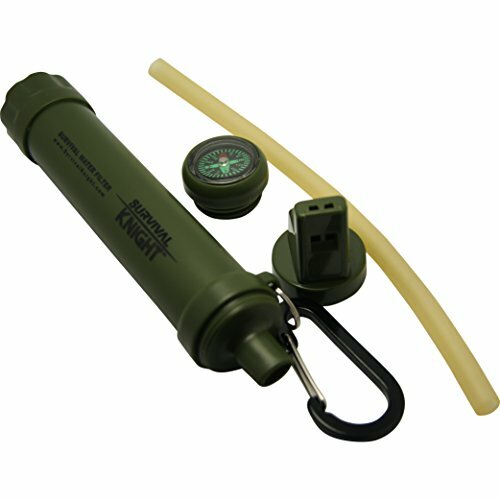 Small light weight, sturdy design, makes this filter easy to carry and pack on trips. Personal water filter stops 99.9% of bacteria and microbes with a .1 micron membrane purifier. Includes other important survival tools: Whistle, Mirror, Compass, and Carabiner. Works with standard commercial, store bought plastic bottles. If you have any questions about this product by Survival Knight, contact us by completing and submitting the form below. If you are looking for a specif part number, please include it with your message.